It’s been a busy time for Virgil Abloh. After his Spring/Summer 2019 collection for Off White™ and his debut for Louis Vuitton, the popular creative has now opened the doors to the exhibition TECHNICOLOR 2 alongside Takashi Murakami. The show called TECHNICOLOR 2 which is being held at Gagosian Paris continues the partnership between Abloh and Murakami. It’s the main art event to see in Paris while fashion week is in motion. 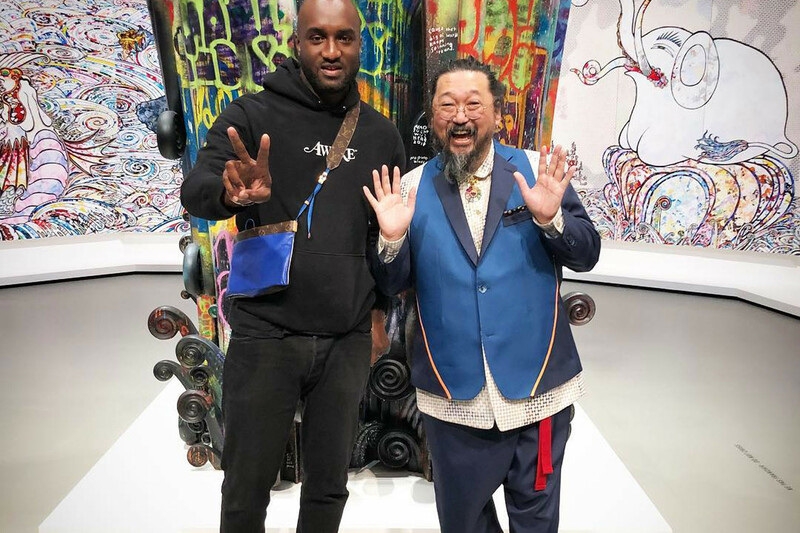 During their recent collaboration, Murakami and Abloh have produced works in which their respective styles and trademarks intersect in a stream of freewheeling, punkish mash-ups. In this exhibition, new iterations of the “TIMES NATURE” (2018) paintings include multimedia works such as “animated” and illuminated paintings, which play on cultural references, ideas of production and reproduction, and concepts of linear time. Two sculptures will be included in the exhibition: in “LIFE ITSELF”(2018), an oversize three-dimensional iteration of Murakami’s smiling flower motif sits in the open doorway of a greenhouse-like structure, expressively spray-painted in black; and in “OUR OUTER SPACE” (2018), Mr. DOB, one of Murakami’s many invented characters, emerges from Abloh’s signature four-point arrow logo. The two artists, kindred spirits from different sectors of a broader cultural zone, reflect incisively on the signs of the times in which we live, while working to disrupt the stratifications of cultural production. The colleagues at Hypebeast interviewed both visionaries. Check out the interview below.